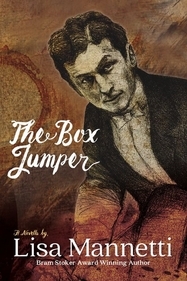 In Lisa Mannetti's wonderfully disturbing novella, The Box Jumper, we meet Leona Derwatt, Houdini's assistant on and off stage, and one of his mistresses. Houdini not only takes her into his confidence, teaching her the intricacies of his magic, but teams with her as they confront and expose fraudulent psychics and mediums of their day. The tension in the story (based on Mannetti's thorough research) involves Houdini's conflicts with fake mediums (who may have been complicit in his death) and Leona's continued run ins with the same phoney psychics later in her life. If you enjoy historical fiction with underlying horror, this novella is for you!